Brilliant , Wonderful, Perfect. Thank you! Nice explanation. That behaviour just reinforces my belief that the software default should have been for the bar or area to extend to the zero line’s position on the Y scale and stop, not for it to extend to the *X scale’s* position on the Y scale. I’m so glad I found this tutorial. Upgrading from Excel 2003 to Excel 2010 at work has been quite traumatic! This was a really nice and easy tutorial to follow. Plus the trick of copying data and using paste special to add it to a chart is a little gem. Thank you so much for taking the time to write this. Thank you for this tutorial. It has helped a lot. 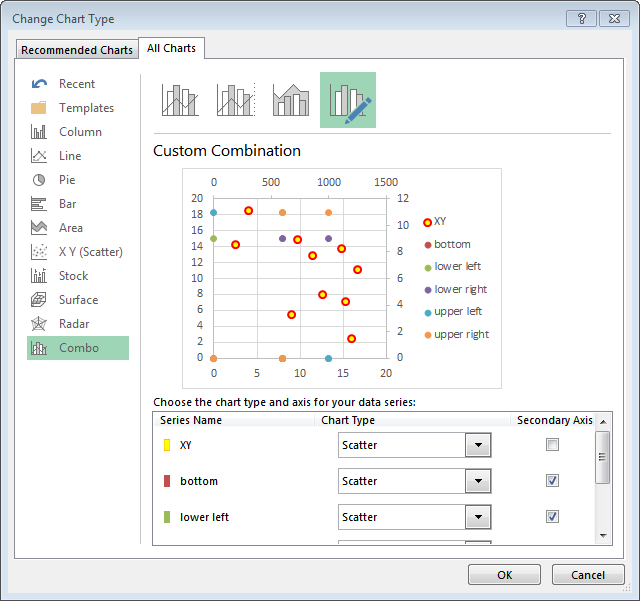 I am using one of your chart GetXYonAnyChart.xls to create custom message when a data point is clicked. It works find on my Excel 2010 but another colleague has Excel 2007 and it doesn’t work there. Nothing happens when I click on data point. No events are getting fired. I tried to do multiple setting changes but nothing worked so far. Would really appreciate if you can provide any pointer on this. 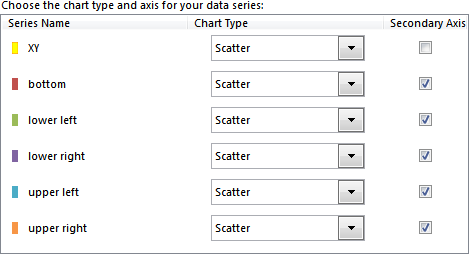 In your example, out of 6 charts on a sheet, the one with scatterline work on Excel 2007 of my colleague. Other five do not work. I changed my chart type to scatterline but that did not work for me. I haven’t looked at that stuff for years. I’m not surprised it didn’t work in 2007. A lot of chart stuff, including the chart event procedures used in that example, were broken in 2007. I remember pulling out my hair whenever I had to program charts in 2007. I never officially upgraded to 2007 for my own work, I kept working in 2003. When 2010 came out, I did move over, and now I’m mostly using 2013. And 2003 looks awfully dated to me now. 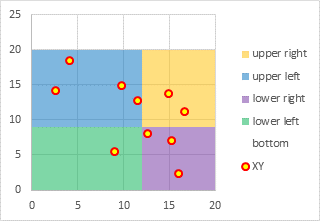 I’m looking for a way to post XY data onto a scatter plot that has unique colored quadrants, as can be seen in the website: http://www.flickr.com/photos/104159538@N06/10071269716/. There are several unusual things about it: One, the axes are not uniform in spacing, and it’s not logarithmic either. Second, I also need to be able to use data where, say I have four data points A, B, C and D, I can choose whether to plot A, C and D or just A and B or even just C by itself. Is pivot table the best option there, and how would I approach it? Thanks so much. I could not get this to work with Excel Mac 2011. The ‘change axis to date’ step throws up an error “the entry is invalid for the data used by this chart. Please enter a value that falls within the minimum and maximum data values used by this chart.” Could not figure out any dates that would avoid the error and show the boxes. The closest I felt to a solution was a discovery that it may be an Office Mac bug. This tutorial is just perfect ! Thank you so much ! I was searching for this kind of tricks since several weeks. I met a problem during the step “Show secondary horizontal axis” (I am using Excel 2010). 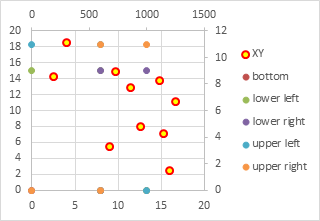 When I try to show the secondary horizontal axis, the only options I have are : “None”, “Show default axis”, “Show axis in thousands” etc but any “Show left to right axis”. 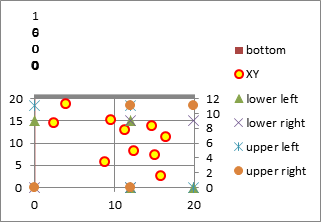 When I try to apply “Show default axis”, the result is only applied to the “Bottom – upper right” data but not for the “XY” series. I could not figure out how to solve this problem. The “XY” marks are still sticked to the left. Could you please help me to solve this problem? Thank you in advance. 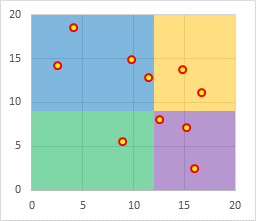 Make sure all five series (bottom, lower left and right, upper left and right) are plotted on the secondary axis. If any are still on the primary, then both axes will scale to accommodate the full 0 to 1000 range of X values, and the markers with their puny X values will be smushed against the left edge of the chart. Thank you so much for this tutorial – it works perfect! 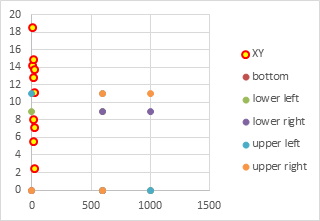 ActiveChart.Axes(xlCategory, xlSecondary).CategoryType = xlTimeScale ). When I check the properties of that axes it is acutally changed to “Date axis”, but the chart still displays diamonds instead of rectangles. Do you have any idea why this happens? By “diamonds”, do you mean the background areas don’t have vertical edges? You probably need to make sure your data in the coded version is the same as in the manual version, which presumably worked. 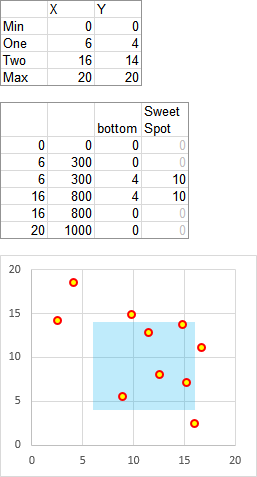 You need two points with the same X value and different Y values to get a vertical line on a date axis. In the old days, Microsoft called the date axis a time axis, even though it could only deal with integers, or whole days, and not fractional numbers, or times. They changed the wording in the dialog, but kept the xlTimeScale constant name in VBA. thanks a lot for your answer. Yes, by “diamonds” I mean “no vertical edges”. The input data for manual and VBA, resp., are the same. But I found a not-so-nice workaround: copy/paste the chart updates it and everything is correct (refresh / calculate / .. wouldn’t do it). Funny thing. I was having a similar issue, that a chart with a shaded background like this was not updating properly when modified using VBA in a specific version of Excel, I think 2010. So in the code I tested for Excel version, and if it was the offending version, the code copied the chart and pasted it where the old one was, then deleted the old chart. Months later when revisiting other features of the code, I wondered if I really needed that workaround, so I tried without copying the chart, and it worked fine. I don’t know why it started working, maybe there was some fix included in some update of Microsoft Office. Thanks for your tutorial, it is great! I have followed it step by step and my chart looks the same as yours but when I change the Secondary Horizontal Axis type to Date Axis the two area series on the left (green and blue) stretch horizontally across the entire chart and the other area series (yellow and purple) disappear. Do you have any idea what the problem might be? Are the series all on the appropriate axis? Thanks a lot for this tutorial, it really worked. 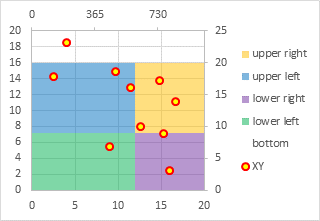 I just have 1 more inquiry, Is it possible to add tags with a list of names to each of the XY points? 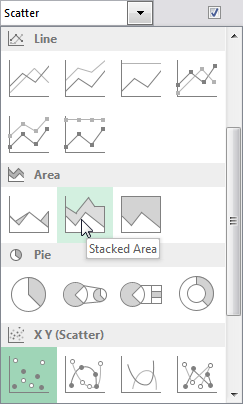 Still very satisfied with your shaded quadrant background tips, very useful. I know this is an Excel oriented tips but I am thinking to migrate to LibreOffice. I am trying to generate shaded quadrant background in Calc but I couldn’t figure it out. Any chance you had experiment this in Calc? I worked through your tutorial, and it worked perfectly. I’m now trying to apply this to an X-Y scatter chart where the X and Y axes start at a -ve minimum through to a +ve maximum. I’m stumped with the minimum as your example starts with a minimum of zero – I’ve tried to figure out what I need to change in the formulae, any guidance would be gratefully received! Did you enter your negative value in D3, instead of 0? I think I tried that, but knowing me I probably didn’t! Thanks for this tutorial, it was very useful. One question: I have used this method to create shaded areas and although it looks 100% when created, something happens when I save and later reopens the file: the shaded areas go skew! 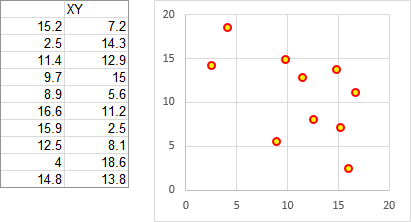 I checked the values at the top and bottom of the area and the horizontal axis values are the same. Have you come across this before? What version of Excel are you using? Excel 2010 sometimes messed this up if none of the service pack updates were applied, and I think 2007 did as well. Brilliant tutorial – very clear and easy to follow. Saved me a heap of time. Many thanks. Presently I was just able to add the X and Y values on the graph. In my application X and Y are used for on supplier. + Select each label (click to select the series of labels, then click again to select the individual label), double click to edit the label’s text, and type the label you want. 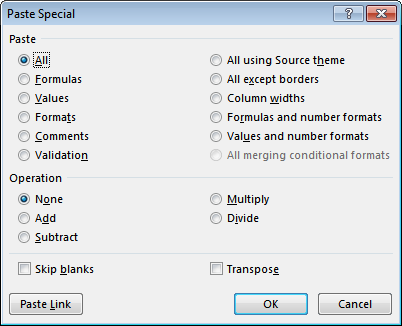 + Select each label (click to select the series of labels, then click again to select the individual label, but without selecting the text of the label or having the cursor in the label), type an equals sign in the formula bar, and click on the cell containing the label you want, then press Enter. The formula bar will show the link, e.g., =WorksheetName!$F$2. 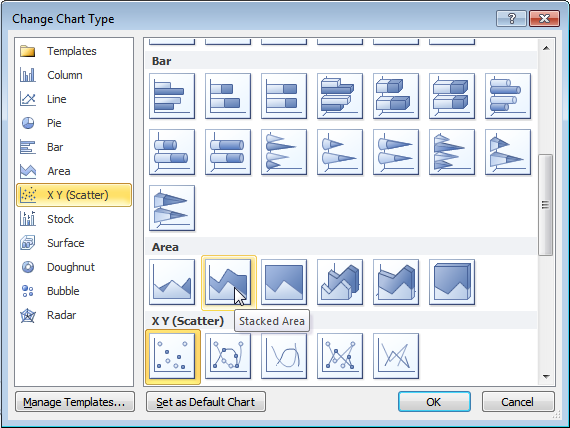 + Download and install Rob Bovey’s free Chart Labeler from http://appspro.com. This allows you to assign labels from a worksheet range to the points in a chart. 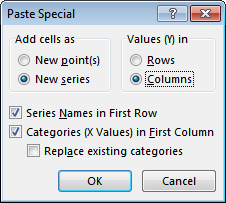 + If you’re using Excel 2013, you can format the labels to use Values from Cells, and select the range of cells containing your labels. Brilliant tutorials, I follow it & works without a fault. Million thanks! Hi Jon, this tutorial is awesome. However when I apply the same concept to my range of data, I get a completely different result. Would you mind helping me figure out where I’m wrong? Thanks for your blog, Jon. 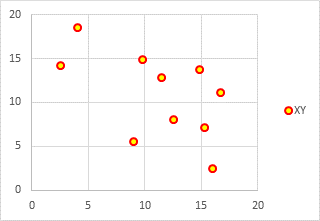 My graph plots scores (X-axis) and Improvement since last tested (Y-axis). It looks fine if I use only +’ve numbers in the Y-range but my range goes starts negative and goes positive. I’ve used the lowest and highest numbers in each range for the Minimum and Maximum and I’ve used the average of each range for the middle point. All other formulas are as per your example. Any suggestions? Hi! Thanks for the awesome guide! I used it many times already! Is there a way to do this with a Bubble Chart? 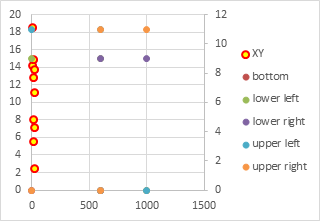 Where you can actually increase the bubble size based on a third variable? 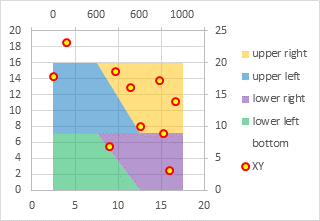 Bubble charts do adjust bubble sizes based on a third variable. However, you cannot combine a bubble chart with another chart type, so no way to get the shaded background on an “official” bubble chart. 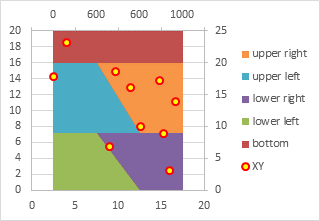 You could try the simpler technique described in Simple XY Quad Chart Using Axes as Quadrant Boundaries. 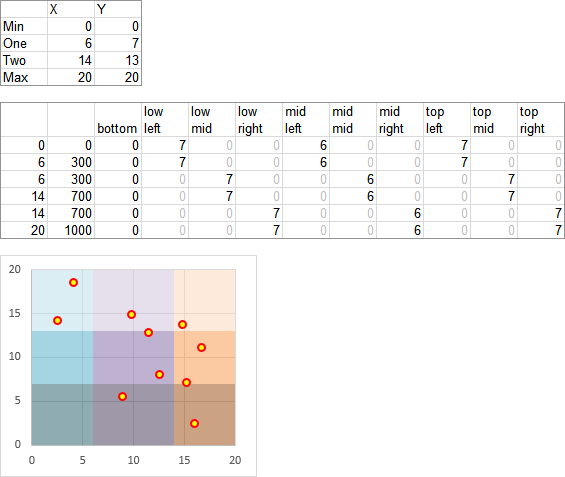 Or you could make an XY chart, and use VBA to modify the symbol size. Neither of these options is formula-driven, so you need to manually move the axes in the first option, or use VBA for either option. Amazing – this worked perfectly! However when I save the file and return to it the horizontal axis has reverted to the original scale and it goes back to the other shading. How can I save it an ensure it stays the same? I’m using Excel 2010. From time to time, I’ve had issues with the date axis being unreliable. What versions of Excel and Windows are you using? Hi Jon, I’m using Excel 2010 on Windows 7. Thanks! 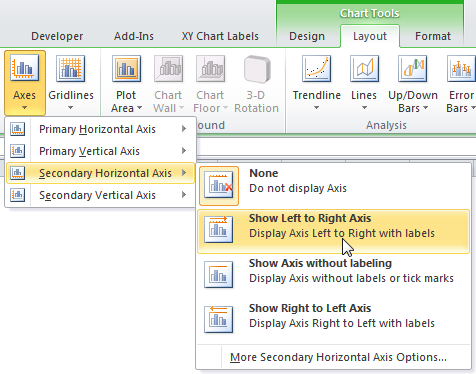 A client has a problem with a quadrant-type chart (mixed XY-Area type) in Excel 2010. This is a chart sheet, not an embedded chart. When the chart is updated, the date axis breaks. Interesting that if the chart is copied, the copy has a working date axis, and the original can be deleted. I don’t know if this helps at all. When I am changing axes one by one. Secondary Axes are not showing. As always, amazing advice. 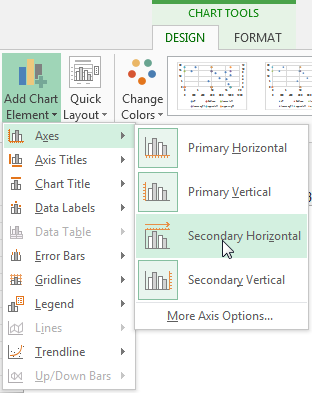 One question though, when I delink the chart (Excel 2010, using your tips here: the secondary axis changes to a text axis and there is no way to get it back to a functioning date axis, which leaves everything slanted. I even tried changing the x-axis values to actual dates to no avail. I know I could copy and paste as a picture, but with xy charts it’s nice if the user can hover over the point to get the values. Any thoughts? I’ve only found one other instance of this issue via Google and no real resolution so any guidance would be appreciated. 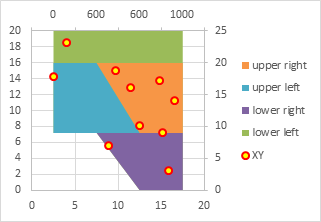 You need to format at least one series so it appears on the secondary axis. At this point, Excel usually shows the secondary vertical axis, but not always the secondary horizontal axis. 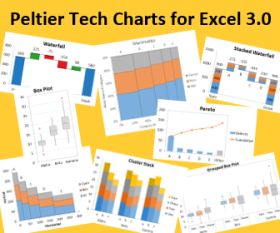 Make sure the axes you want are visible using the Axes controls on the ribbon, or the Axes item in the pop-up when you click on the “+” skittle floating next to the chart in Excel 2013+. What version of Excel? 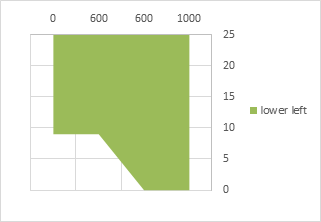 I recall that charts in Excel 2010 would sometimes not work correctly when the time axis data was delinked from the worksheet. 1) When I change the secondary horizontal axis to “date”, I completely lose the lower and upper left boxes. 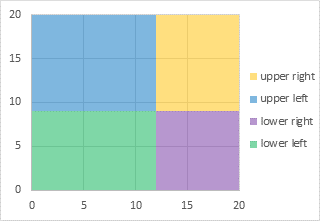 2) I want the four boxes to meet at one specific point, but it seems like no matter what values I change for the 5 boxes, the layout stays exactly the same with only the secondary axes changing. Thanks a lot Jon, This blog has helped me lot. 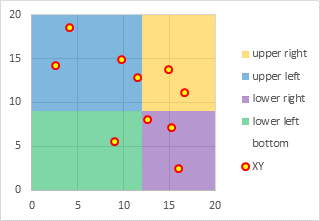 Just wanted to understand if there is a way to reduce the width of specific quadrant in the chart. With this approach, you can change the width of both quadrants in a column, or both quadrants in a row, by changing the values in cells C4:D4 in my example. Can you do this with percentages? I have growth as a percentages as my x, and margin as a percentage as my y. Everything seems to work up until I change the secondary (top) horizontal axis’s Axis Type to Date Axis. At this point, I lose my quadrants. hi,jon,thank you for this tutorial, inspire me a lot. 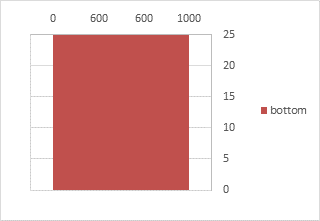 when i try to make this graph, i found that the stacked bar chart can do the trick, and the backgroud data can be simpler. and i am very interested in the way you treat the data. You can use percentages, but you have to process them like any other data. In the section called “Background Data”, you X value percentages go in cells C3:C5, and they are converted in C8:C11 into values normalized to a full scale of 1000. For simple quadrants, for example if the left and right parts are the same width, then yes, stacked columns are easier. But using areas make the approach a little more complicated and a lot more flexible. jon,the way how to construct the background data for stacked aera chart is charming, and can u share how can i master such skill. Fiz os passos conforme descrito, mas quando altero o tipo de gráfico para área empilha, o eixo secundário horizontal superior se altera (Fica: 1,2,3,4) e quando realizado a alteração do tipo de eixo para “Eixo de Data” não ocorre nada. As figura continuam do mesmo jeito. Poderiam me ajudar? 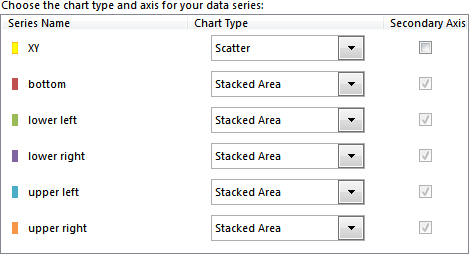 I did the steps as described, but when I change the chart type to stacking area, the upper horizontal secondary axis changes (Fits: 1,2,3,4) and when changing the axis type to “Data Axis” Nothing happens. The figures continue the same way. can you help me? When I make date axis on horizontol, nothing happens? Could you share your data with me? Could you share your data? 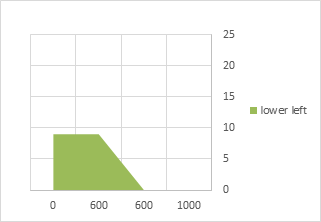 I used this technique to produce a chart with diagonal shaded areas. In that case I had to change the secondary horizontal axis to text axis.